Hello, Why Alo is the Adele of Toronto’s Dining Scene. Adele is a refreshing change to the music scene. In an industry filled with nauseating pop tracks and the flavour of the week singers, Adele’s haunting voice reminds us that there is still hope, even in 2015. I’m not one that tried to get concert tickets for the four Toronto shows she sold out in minutes but I’ll admit if I’m flipping through my Sirius radio and “Hello” comes on I’ll leave it and say hi right back. A common misnomer of the names of Adele’s albums (19,21 and 25) is that they represent her age when they were released. In fact, they reflect her age during production (this may be a way to win a pint during Adele night at your local pub). For example, her latest album, 25, was released when we was 27. “Rumour has it” that future albums will not follow this trend. I listened to a bit of an Adele town hall and was surprised how down to earth she is. She’s British polite but at the same time could likely hang out with the Gallaghers (the English ones) from Shameless. Her album 21 was inspired as she listened to music her bus driver played as she toured the American south while she chain smoked (a habit she has recently quit). That said, she cites numerous other influences toher career ranging from Ella Fitzgerald to the Spice Girls (she was apparently traumatized when fellow ginger Geri Halliwell left the group). I bring up Adele as a metaphor to the Toronto dining scene. Food trends are as volatile as musical ones. People in the 80’s were happy eating bananas foster, cherries jubilee and baked Alaska while listening to Thriller or waiting for the next Madonna single. In the last couple of years, both music and food have become a bit flash in the pan, probably to appease the minute attention span of those in generation X. Bands are now judged by singles and not albums and it’s hard not to confuse Walk the Moon with the Imagine Dragons. At the same time, Toronto’s dining scene has been driven by spur of the moment snack foods and small plates and compared to other entertainment-heavy metropolitan cities like San Francisco, Chicago and New York, and tasting menus are somewhat scarce. Alo has burst onto the scene with the promise of bringing back the tasting menu while at the same time not jeopardizing the foodie’s right to choose. Stacked with well known names in Toronto’s culinary scene with Patrick Kriss at the helm, it has opened to great accolades including a bold endorsement as the city’s best new restaurant by the Globe and Mail’s Chris Nutall-Smith. Instead of writing about the minutiae of each of the many dishes, I figure I’d pay homage to the music industry and do a top ten list of things you need to know about Alo complete with the top 10 songs on December 26 2015 vs Boxing Day 1985. Hidden between the entertainment district and trendy Queen West, its location is both convenient and a little odd at the same time.When I say hidden, I’m not kidding; I felt like an amazing race contestant looking for Jon Montgomery’s smiling face. The only way to identify the entrance is a keen eye for a tiny sign or a good GPS. In fact, the first question you are asked upon arrival is “Did you find the place ok?” Plus, you need to take an elevator to get to the dining room. I find myself humming this in my car one day……”Alo’s on the other side, I must’ve passed it a Thousand Times”. A short elevator ride up a few floors opens into a swanky but simple bar stocked with a number of premium spirits just waiting to turned into a number of trendy cocktails. A few steps forward and the small but open kitchen, cramped with bustling white coats becomes visible. Beyond that is the smallish seating area which has a casual yet classy demeanor. 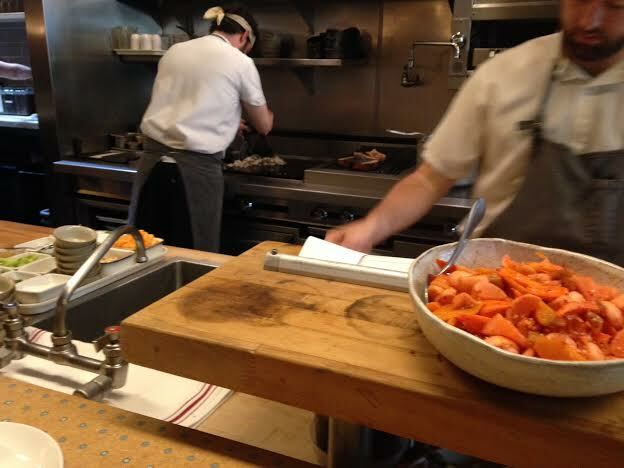 The waitstaff, donning ties tucked into their crisp white shirts are busy circulating the grounds with a fluid flow. Not quite posh and not quite rustic, the decor is simple and despite the small space patrons have plenty of room as the tables are nicely spaced. Even the serving dishes were chic and modern but not extravagant. I will also put clientele under decor as there were definitely an array of patrons present. I think the couple beside us were on their third or fourth match.com date and she was working really hard to impress him with her culinary knowledge but it fell as flat as a bad souffle. Equally entertaining was a really angry looking man sitting at the end of the chef’s rail who sat stoic for the duration of the meal. On the way out we saw him speaking to the chef so I suspect he was of the mercurial members of Toronto’s dining scene. Those chefs roll deep you know. As mentioned, there is no shortage of premium cocktails available at Alo. I started with the Longchamp ($14), a simple and smooth bourbon based creation which hits all the notes of a classic sipping cocktail. They also offer a reasonably priced wine list and stick with the bigger, more recognized brews such as Kronenbourg and Blanc De Chambly as opposed to the numerous and trendy craft beer in the area. Like stated in countless other reviews, Alo features a 5 course tasting menu for $89. Perhaps what’s most unique about this is the fact that there is a choice for each of the 4 savory courses (plus the mid-dessert) as opposed offering either a standard menu for everybody or only an option for the main protein. They even set the stage for such free will (maybe it’s a question like when you are testing an audience response system) by offering a choice of a blue or white napkin . It was rather odd but memorable. Deux Amuse Bouche. 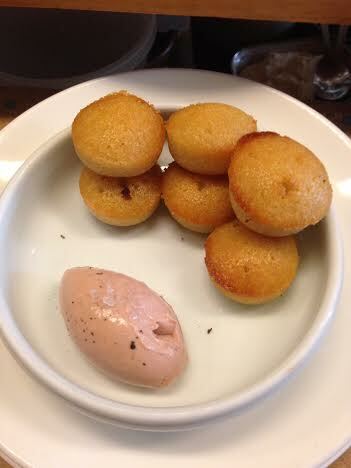 You are immediately treated couple of small souffles (I’d call them crackers) garnished with a garlic aioli. With the re-emergence of the tasting menu comes the resurrection of foam emulsions in the form of the second amuse, fennel, olive oil and citrus. It was a bit heavy on the oil flavour little light on the citrus. In what I think is a first, the bread is actually served (complete with house churned butter) as a course. It was rich and buttery and reminded me of a sinful cousin of a croissant. When I asked for directions to the washroom the waitress looked pleased to be able to assist. I was somewhat confused as she led me through the bar to a black wall until she pointed to a magic door which opened into the hidden lavatory area. Yes, I am amused easily. I rarely order tea at dinner but for some reason I had the desire to do so. Once again, the waitress seemed pleased with my request and promised to return with the tea box. When she opened it, I felt like a leprechaun that had just found a pot of gold. A dimly lit screen confidently describe each tea which was housed in a small, transparent container. It was a little classy and a little cheesy but another example of the incredible attention to detail theme of the evening. In a nice touch, you are provided with a wax-sealed envelope at the end of the night which contains the menu for the evening. Instead of reviewing each individual dish, I will summarize by saying the food was good but not mind-blowing. I think it can best be described as rich and earthy with proteins which included snails, mushrooms, duck, fois gras and pork. There were also some options from the sea including halibut, salmon and lobster. Even with those, the earthiness was maintained with the use of ingredients like sunchokes, truffles, potatoes and artichokes. The proteins were cooked beautifully except for the duck which was overdone. If anything, some of the dishes were lacking acid and seemed a bit unbalanced but some of that may have been the way I ate them. For example, I found the first bite of the mushrooms very single-noted until they were mixed a little more thoroughly with some of the other ingredients and became a delicious forest porridge. 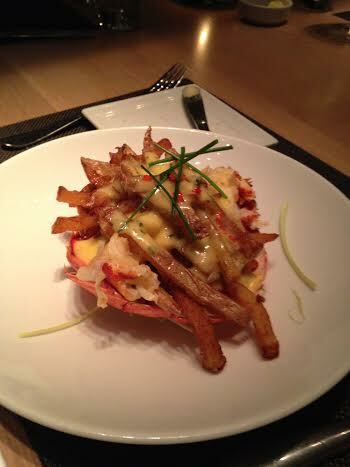 I would always choose lobster over foie gras but the latter was the standout dish of the night. It was smoked which perfectly balanced with the fattiness of the liver. I only had a bite and truly regretted not ordering it as my starter. There is no dessert listed on the menu so ever before any hint of the final course, you are asked if you would like the optional cheese plate ($15). In the name of adventure we agreed. The featured fromage was Five Brothers, the delicious signature cheese from Gunn’s Hill in Woodstock and was served with fruit, honey and crackers. We ordered two plates was plenty for the four of us. Around the same time, we were asked our choice for the mid-dessert; dark, milk or white chocolate. We joked that, being the token Caucasian at the table, I was obligated to order the white chocolate. I went dark. Expecting the the chocolate right after the cheese, we instead received a small bite consisting of parsnip and espresso instead. It was fantastic. Afterwards the waitress, hearing our earlier conversation, brought both the white and dark chocolate to the table for me. Each was unique in its own way and even the white chocolate was quite good. Thinking the meal was done, a third dessert arrived in the form of an earl grey parfait (which retrospectively makes sense since she did say the chocolate would be a mid-dessert) arrived at the table. It was like some of the savory dishes in that it had to be eaten with a game plan. The ice cream itself was not strongly flavoured with earl grey unless you were sure to include some of the candied bergamot it was garnished with in each bite. When all was said, the price with a few drinks (no wine) before gratuity was $135/head. 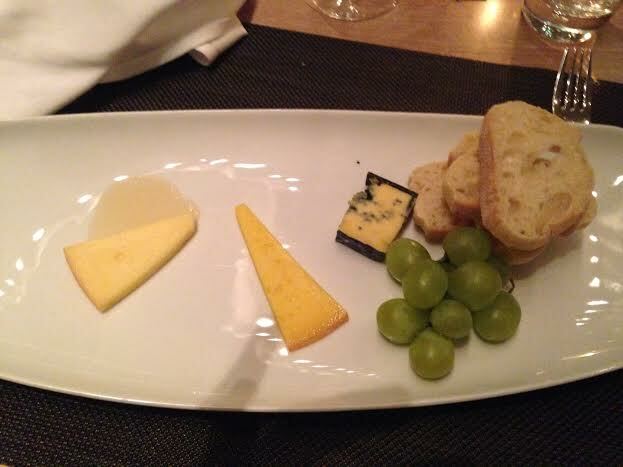 The cheese itself was $15/plate. However, given the fact that it took nearly 5 hours and there were technically 11 courses means you if you are on a date you don’t need to worry about doing or spending anything after. The portions are small and the purists would argue that it is probably overpriced but when I consider the whole experience I didn’t think it was too unreasonable and I left stuffed. Although these points are not necessarily in rank order, it would be remiss if I did not put service at number one. In fact, I cannot think of a time in recent memory when I have had a better service experience in the GTA. The flow of the meal was spot on. Among the numerous staff members who served the table, all were highly professional and explained the components of each dish with great precision. The addition of the white chocolate based on a short conversation at the table was, well, the icing on the cake. Alo has successfully resurrected the tasting menu in Toronto by offering a combination of good food and incredible service. Add a few surprises and you are left with a truly memorable experience. The foie gras and innovative dessert courses were the highlights of the menu. The attention to detail, from the tea box to the take away menu, is unmatched. In sticking with the music analogy, Alo is like a good album. Not every song is a blockbuster but collectively it’s great listening. You feel the experience instead of just doing it. In other words, in an environment filled with countless eateries which mimic the flash in the pan tendencies of American idols, youtubers and one hit wonders, Alo may in fact be the Adele of Toronto’s culinary scene. I’ve met a few celebrity chefs in my travels. I ran into Lynn Crawford at a food truck festival, met Mark McEwan at a Second Harvest event and snapped a picture of Guy Fieri through the glass at Lakeview diner. I’m not very bold in these endeavors. I usually only approach if they are available and usually if somebody else has already asked for a picture before me. This might explain my reluctance to Susur Lee. First of all, he scares the hell out of me. I don’t think I’ve ever seen him smile and I still remember the way he ripped apart chef Eric Wood during an episode of Chopped Canada. I was in Toronto at staying in the King and Portland area so I decided to stroll the neighbourhood in order to grab a bite. I was thinking Portland Variety, the new menu at Valdez or maybe a sausage at Wvrst. The last thing on my mind was Lee but as I walked down the sidewalk I looked up and sitting on the patio of his own restaurant was Susur himself. He was dressed in a burgundy blazer with the same stoic look I have always seen on TV. He seemed engrossed in a business meeting with members of his staff so the last thing I wanted to do was interrupt. Instead I texted a few food geeks I knew informing them of my discovery. I attempted to snap a picture but with my already horrendous camera skills it didn’t go well. I was still undecided about where to dine until I saw a small sandwich board advertising happy hour at Lee which offered $10 cocktails and a small 1/2 price bar menu. Sounded good to me. I walked in and had a seat at the decent size bar. A friendly bartender was waiting and quickly handed me a food and drink menu. The drink menu offered 6 cocktails which had an array of spirits as a base. 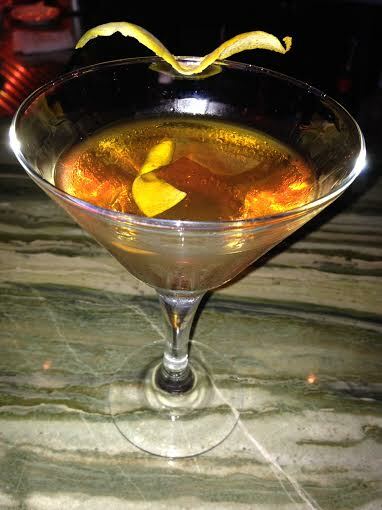 I started with a burnt orange manhattan (knob hill bourbon, vermouth, grand marnier, cointreau, orange cream citrate). It had a classic taste with a little twist. 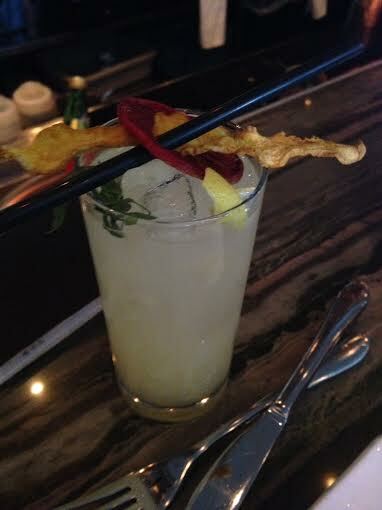 The bartender even flamed the orange peel for extra effect. Although Knob Creek is not my favorite bourbon, it was still a great cocktail, especially for $10. The half price bar snack menu consisted of 5 items so I went all in and ordered them all. 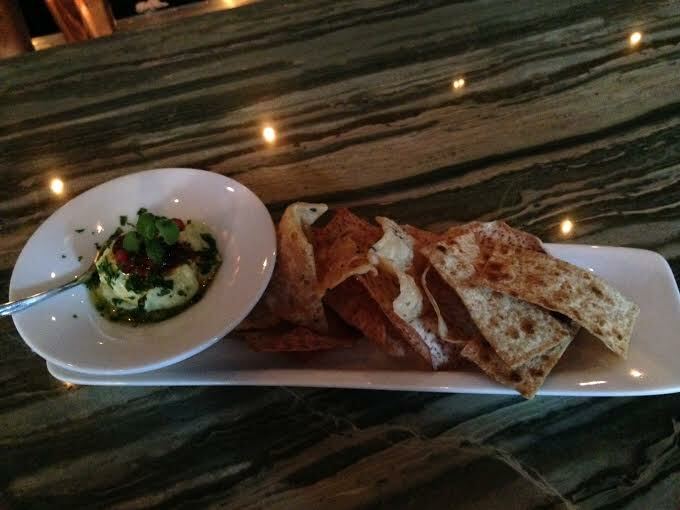 The first to arrive was the edamame hummus dip ($4) served with sesame crisps, taro root chips and pomegranate. The silky texture was heavenly and the normal earthiness of a chickpea hummus was replaced with a fresher flavour. The punchy pomegranate seeds and taro chips were great compliments. At this point, a buddy of mine joined me. Shortly after, the spicy tuna tartare and black pepper tuna tataki ($6), spicy jerk chicken ($6) and cheese burger spring roll ($7) arrived. 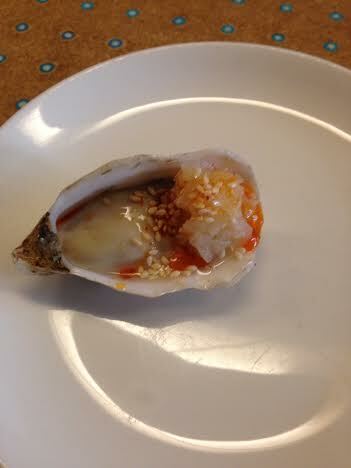 The tartare and tataki were served on a rice cake and topped with red pepper relish. The tuna was prepared perfectly but was blunted by the overwhelming rice cake. The flavours were there, just disproportionate. 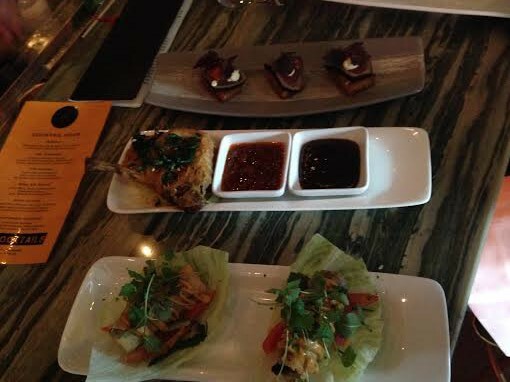 The cheeseburger spring egg roll was a brilliant concept, especially with the lettuce wrap and pickled vegetable. 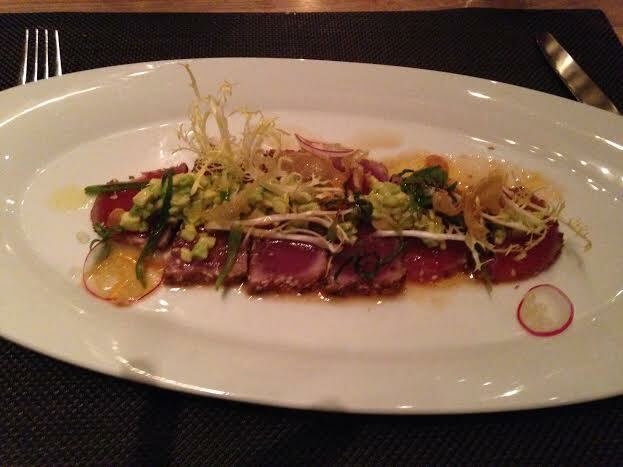 Once again, like the tuna, the main protein was lost among the numerous other things on the plate. The spice jerk chicken served with the tamarind glaze and chili sauce was phenomenal and easily the best dish of the night. Moist chicken and a very crisp and aggressive seasoned coating was perfect as a stand alone but the sauces enhanced the flavour even further. It was so good we ordered another one. The last dish on the bar menu was the fois gras and chicken liver pate. Served with ice syrup, ginger mango and ciabatta for $7. It also had some housemade blueberry compote. Although pate is rarely my preferred choice on a menu, this worked on all levels. 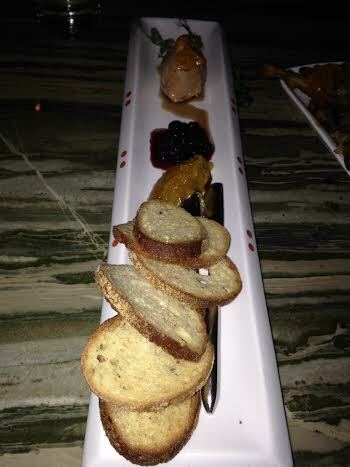 The texture of the pate complimented with the contrasting sweet and gingery condiments were delightful to the palate. Ironically, I didn’t eat all the pate but the the rest of the plate didn’t stand a chance. For a second cocktail, I ordered a Mayan Solstice, a tequila and gin based drink with chili infused lime juice, cucumber and green apple (with a little chartreuse). This was fresh and delightful but the heat from the chili was adequately present with every sip. It was a great cocktail. Whether it was a few cocktails or an general enjoyment of the food and atmosphere, I saw a couple across bar order Susur’s Signature Singaporean-style Slaw. I felt that the guy from “The Source” commercial who sees his creepy neighbour dancing, looks at the speaker and says “I want that”. 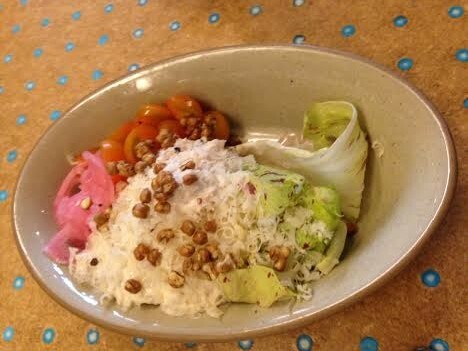 This $22 salad is one of the most recognized dishes at Lee. It’s an architectural feat, constructed with 19 ingredients. After a detailed description. the waitress skillfully destroyed it into something that could fit in one’s mouth. 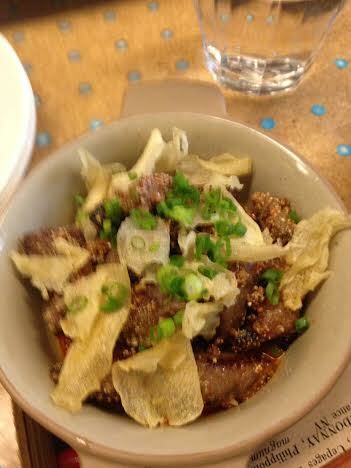 As much as it was eye candy, it was alliterative mouth candy as well; sweet, salty, sour, spice, savory and sublime. I stumbled across happy hour at Lee by chance. It started with a chance sighting of Susur itself and lead to an enjoyable meal. Although it is not your typical cinq a sept joint, the staff are welcoming and treat you as well as somebody who might be dropping a few hundreds bucks for dinner. The cocktails were above average and a great value at $10. The bar food was a nice representation of Susur’s intense and diverse flavour profiles although I found the tuna and spring rolls a bit disproportionate. I’d order two jerk chicken right off the bat just to save yourself a wait. If you like pate, Susar’s is a must. The hummus was excellent as well. The King and Portland area has become the epicentre for the snack food movement in Toronto and Lee has jumped on board (at least between 5 and 7 anyway). 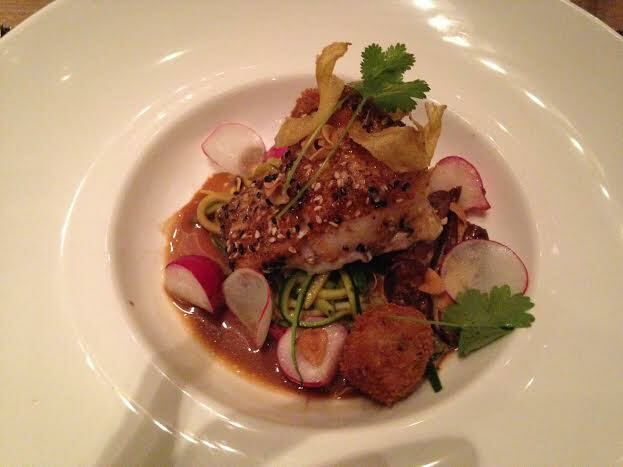 The result is a successful menu which offers a sample of Susur’s bold flavours. Both the cocktails and food are a great value but be warned, you may be tempted to indulge in things like the signature slaw or other dishes which cross your path. In the end, although Susur didn’t look overly happy during his own happy hour, I sure did. I waited 45 minutes with my daughter to get on that swan ride at Wonderland. You know, the one where you ride a plastic bird at a quarter mile and hour in 2 feet of stagnant water for what seems like an eternity so your kid can feel like the queen of water fowl. I once waited with my grandmother for 45 minutes in anticipation of the next K-mart blue light hourly special. Elated by securing some fancy glassware she just bought, she was more than happy to wait for the opportunity to snap up the next deal on women’s hosiery. My mother asked to me wait in line for almost an hour to get her a limited edition commemorative royal family beanie baby a number of years ago. I stood in line with a bunch of blue hairs bragging about their collection ranging from the Princess Diana purple rose bear to some rare fish named Bubbles. Come to think about it, I ordered a pizza in university circa 1993 that I’m still waiting for so I guess 45 minutes isn’t that bad. As time went on, the line got longer and it also got fatter. I never read the memo where one person was allowed to get there early and hold two or three spots for friends showing up later. By the time 530 rolled around, there were more like 20 or 25 ahead of me. When the doors finally opened, the line quickly funneled in to the open doors. Group by group, patrons were seated. I was starting to sweat a little when I finally got to the front of the line. The two groups in front of me were still waiting for truant tablemates so they were asked to move aside until the whole party arrived. I gladly proclaimed “Table for two and we are both here!’. The woman at the door (who turned out to be one of the owners), yelled out 3/4 as we entered State Bird Provisions. It turned out 3/4 means we were seated right in the middle of the chef’s table. Let the fun begin…. The best dish of the night. Six quail eggs are flash fried in a hot skillet among a flavourful broth boasting a nice blend of heat and acid. I asked the chef about it and he let me know the heat came from pressed jalapeno juice (not brine from a jar of picked peppers). Brilliant! It was also served with chunks of Mt. Tam cheese, pea hummus and a few garlic chips. I discussed this local cheese in a previous blog but as a reminder it’s a local brie-like cheese that added a wonderful silkiness to the dish. 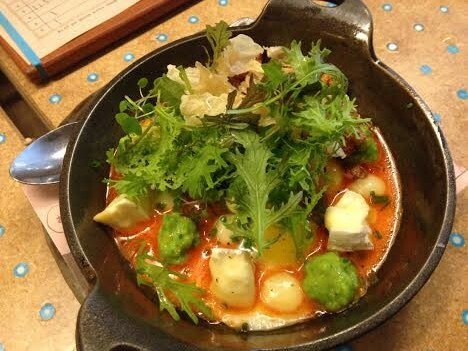 Combined with the earthiness and freshness of the hummus and along with peppery arugula, it was a complete dish that was a cross between a destructed omelette and having the supernatural ability to consume many components of a tasty volcano. I got to watch the creation of this dish from start to finish. It’s remarkably simple. Quality beef quickly fried on a flat top along with copious amounts of rice flour (which i thought was salt until he added about a cup of it on the beef) which browned nicely, keep the meat moist and added a delicious crisp coating. 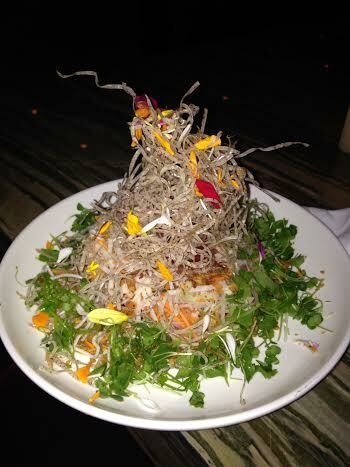 It was topped with fresh scallions and garlic crisps for extra visual effects and flavour. California has the privilege of having one of the only edible state birds. 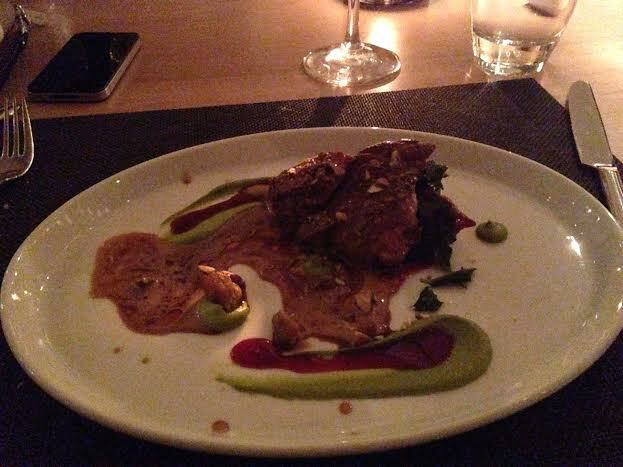 I find it interesting that I can’t pick a trillium in Ontario but I can eat a quail in California. I’m sure this liberty isn’t granted in every state. After all, Robin au gratin from Wisconsin or Tex-Mex Cactus Wren from Arizona certainly does not sound as appealing as a chunk of deep-fried Californian quail.The coating on the half bird was crispy and seasoned nicely. It was a tricky but enjoyable navigation to eat the small bird in fried chicken fashion but well worth the effort. Useless trivia fact: the cardinal is the most common state bird (7 states-Illinois, Kentucky, Ohio, North Carolina, Indiana and both Virginias) followed the Western Meadowlark (6-Kansas, Montana, North Dakota, Nebraska, Oregon and Wyoming) and mockingbird (5- Mississippi, Arkansas, Florida, Tennessee, Texas). A very quirky fish girl snuck up behind us offering a tartare prepared table side. The salmon looked beautiful so it was hard to resist. 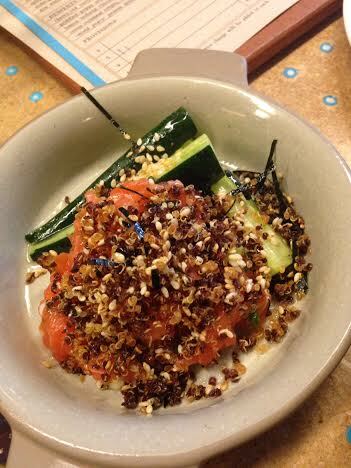 The tartare was scooped atop some modestly pickled cucumber and topped with a delicious blend of toasted quinoa and roasted seaweed. Nothing beats freshness and the salmon fit the bill. No need for crostini..the quinoa mix gives it the perfect amount of crunch. I missed the first go around of these single dumplings soaked in broth. Thanks to one of the chefs who hunted one down for me a little later, I was able to indulge. Dumplings are a simple creation that can be screwed up quite easily. 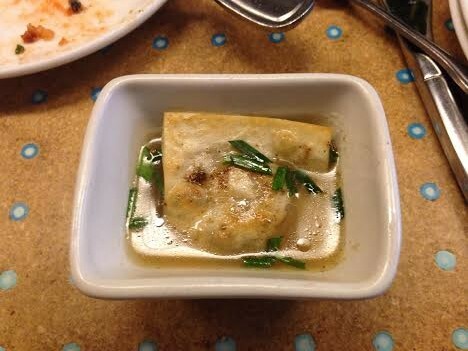 The dumpling was crisp but not overcooked and the filling to dough ratio was perfect. 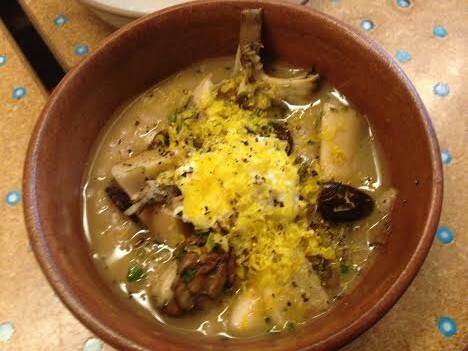 As promised, the broth was aromatic although a little surprising. I’m used to salt as the predominate taste in a dumpling broth and in this case it was more sour and complex but delicious nonetheless. I love oysters. They are a glorious way to begin a meal. I have been teased by friends of mine that I look like a kid in a candy store when I order them. I take great pride in the careful construction of the oyster including ensuring it is loosened from the shell and has the appropriate amount of horseradish, mignonette, seafood sauce etc. In other words, every mollusk is a canvas and I get to play with the paint. Keeping that in mind, I found the oyster delicious with balanced and unique seasoning. It’s just a shame I couldn’t play with it some more. Although no dish was sold to us in used car salesman style, the most boasted item was the duck liver mousse which has been a staple since State Bird opened. I took the opportunity to take a jab at the chefs but reminding them that duck liver is not as common in Canada because we can still serve fois gras in restaurants and duck liver is a weaker substitute. The mousse was smooth, light and fresh but what impressed me the most were the almond biscuits. In most cases, the savory and liver-bitter spread is served with a neutral crostini but the sweet biscuit brought it to a new level. A unique spin on the classic caesar, it had all the elements with a few surprises like pickled vegetables. It was a good salad, just not as remarkable as the other menu items. I’m pretty sure I have this dish right. I remember it describe as similar to porridge. The flavour from the nicely cooked mushroom was front and centre but I did find the dish got boring and predictable very quickly. It wasn’t bad put did pale in comparison the number of other dynamic and taste bud teasing dishes I ate during the night. I loved the smoked egg yolk but it got a little overpowered by the predominant mushroom flavour. Although I enjoyed watching this dish being made more than any other, in the end I was a little disappointed by the flavour. The dough is rolled with precision,dropped into hot oil and fried donut style. 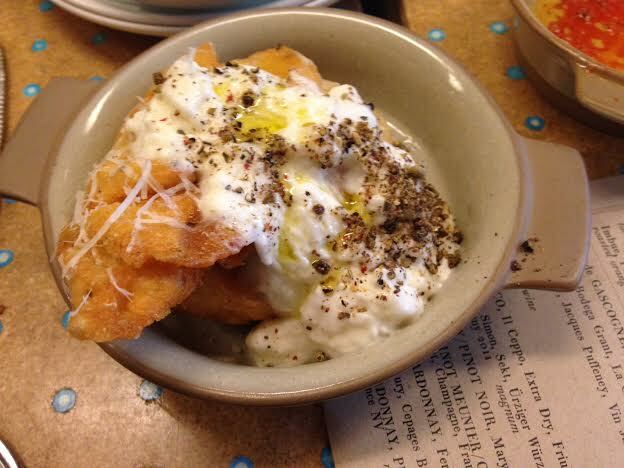 It is then seasoned and finished with the new San Francisco treat and ubiquitous bay area cheese…burrata. The underseasoned crispy bread coupled with the bland and sloppy cheese just didn’t work for me although I did enjoy the aggressive use of the black pepper. 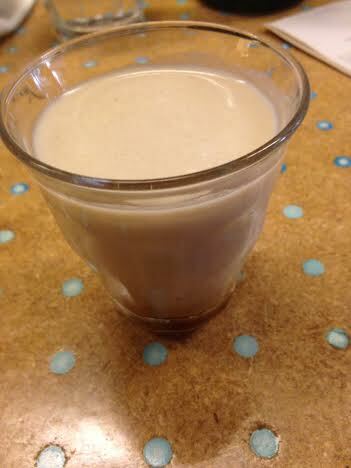 BONUS: Shots of ‘world peace’ peanut muscovado milk! When we decided to pass on dessert (we both had other engagements to attend), the staff almost looked sad. They take enormous pride in their dishes and would let us leave without having a shot of the world peace peanut milk. One word: outstanding. It was a delicious nectar which collected the X-factor of the delicious legume into one delightful shot. 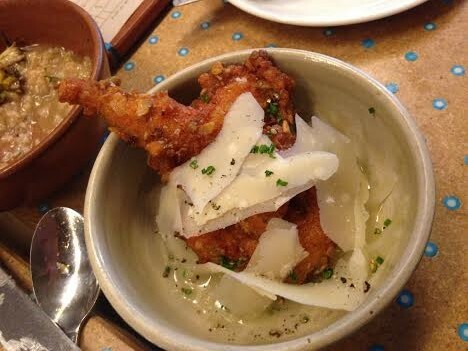 There were some initial annoyances and misconceptions that I had about State Bird Provisions. First, I found the reservation system stupid and annoying. Second, star sightings like Ryan Gosling and the national hype made me think the vibe would be pretentious. My mind was changed with the fact that when I emailed them in advance to ask a few questions, they were authentic and cordial in their responses. Once you are in the place, you are treated like royalty or a VIP member of an exclusive party. No fewer than 6 staff members talked to us, told us their stories, explained the food and beamed with an authentic pride unlike most restaurants I have dined in. They got to know you, asked for opinions and treated you like a human, not a credit card. In summary, it was delicious FUN. They didn’t need gimmicks or loud music or dorks with attitude dressed like fools to create a self-serving brand. Instead, a cool concept with great service and fantastic food with the customer as the focal point is what earned this place a Michelin star. As for the 45 minute wait, the experience inside made it well worth it. It’s not like I haven’t wasted an hour or two of my life before; I did watch the Place Behind the Pines after all.